"Sampath Speaking" - the thoughts of an Insurer from Thiruvallikkeni: India wins 3rd ODI at Trent Bridge goes 2-0 up.... parttime bowlers to the fore ! India wins 3rd ODI at Trent Bridge goes 2-0 up.... parttime bowlers to the fore ! Victory tastes sweet, especially when it comes after thrashing – happy day for Indians at Trent Bridge – where at the start of the Test Series, the tail, first Indian and then English – made history. Trent Bridge is located on river Trent, one of the major rivers of England. Its source is in Staffordshire, flows through the Midlands and joins the River Ouse at Trent Falls to form the Humber Estuary, which empties into the North Se. Trent Bridge is an iron and stone road bridge across the River Trent ~ there is town Trentbridge which houses the Cricket ground, the home of Nottinghamshire. Call it luck or tactical, the change seems to be working – after that disastrous Test Series, BCCI announced that former Captain Ravi Shastri would be the Director assisted by Sanjay Bangar and Bharat Arun as the Asst. coaches of the team. R.Sridhar became the fielding coach – and overnight Indian fielding and catching has improved quite a few notches ! It was over no. 34 – part-time offie Suresh Raina was bowling – he did not even care to turn to receive the throw from long- perhaps thought the fielder to be slow – bang came the throw from Mohit Sharma disturbing the stumps directly and Ian Bell was short of crease…….. Earlier Dhoni won the toss, put England in – and they cruised – now a days – in ODI, teams are playing the first few overs rather slowly, may be due to the fact of 2 new balls …. 10 overs 45 seems to be the norm. In the prematch hype, Gavaskar, Ganguly, and Harsha Bhogle spoke about host of things including spinners succeeding when pacers remove the top early – and the role of part-time bowlers – Ganguly happily extolled that he was never a part-time bowler … When MS Dhoni won the toss he spoke about wanting to bowl because of "early morning help" for his quicks. Bhuvneshwar Kumar had the ball curling around, producing plenty of edges, he couldn't produce the breakthrough. An hour after the start, England were comfortably placed at 75 for 0, with Alastair Cook finding semblance of ODI form and Alex Hales providing some of the dynamic hitting he was picked for. ~ and Dhoni this time employed 7 bowlers – Alex Hales got out to Raina – then Dhoni used plumpy Ambati Rayudu – who tried bowling a la Muralitharan – Cook, charged at him, missed – Dhoni doing the rest. 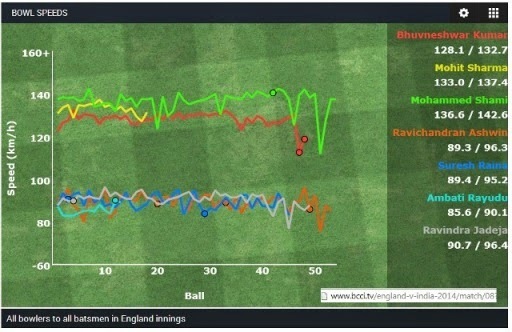 Once the occasional bowlers claimed wicket apiece came Ashwin and Jadeja – from 82 without loss, suddenly it became 149/6 and eventually all out for 227. Between 18th and the 44th overs only one four was hit. That parttime bowl was necessitated by the injury as Mohit Sharma hobbled off the field with a leg injury in the 11th over. He came back but was not required to bowl. That throw from deep by Mohit claimed Ian Bell, who was run out for the 16th time. Marvan Atapattu, tops with 41 while Rahul Dravid and Inzamam-ul-Haq have been run-out 40 times – though the no. of matches vastly differ. India had a methodical chase, finishing in 43 overs with 6 wickets in hand. Dhawan failed. Rahane 45; Kohli 40; Raina 42 made runs and Ambati Rayudu remained unbeaten on 64. Ashwin was the man of the match. One Dayers : 8 Oct – Kochi; 11 Oct – Vizag; 14 Oct – Cuttack; 17 Oct – Kolkata; 20 Oct – Dharamshala. T20 : 22nd Oct Delhi. Test Series : 30 Oct – 3 Nov, Hyderabad; 7 Nov – 11 Nov, Bengaluru; 15 Nov – 19 Nov, Ahmedabad.